There is a sacredness about the belongings of good and great men which is quite apart from the value and significance of the things themselves. 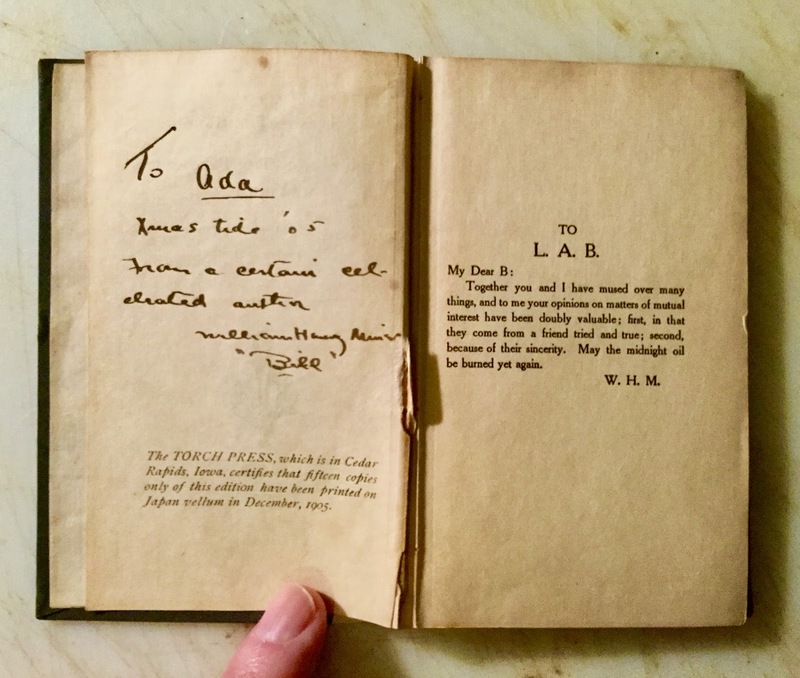 Their books become especially endeared to us; as we turn the pages they have loved, we can see another hand pointing along the lines, another head bending over the open volume. A writer's books make his workshop and his pleasure-house in one, and in turning over his possessions we discover the field in which he worked and the key to his garden of the Hesperides. Leigh Hunt was one of the first English authors whose books I collected–after Samuel Johnson, of course! I had taken up book collecting in my off-duty time while serving my last overseas in England with the U. S. Air Force before retiring in 1989. I became acquainted with a slew of English authors, among them Samuel Johnson, Leigh Hunt, Austin Dobson, Augustine Birrell, Sir Arthur Quiller-Couch, Charles Lamb, and Henry B. Wheatley, just to name a few. 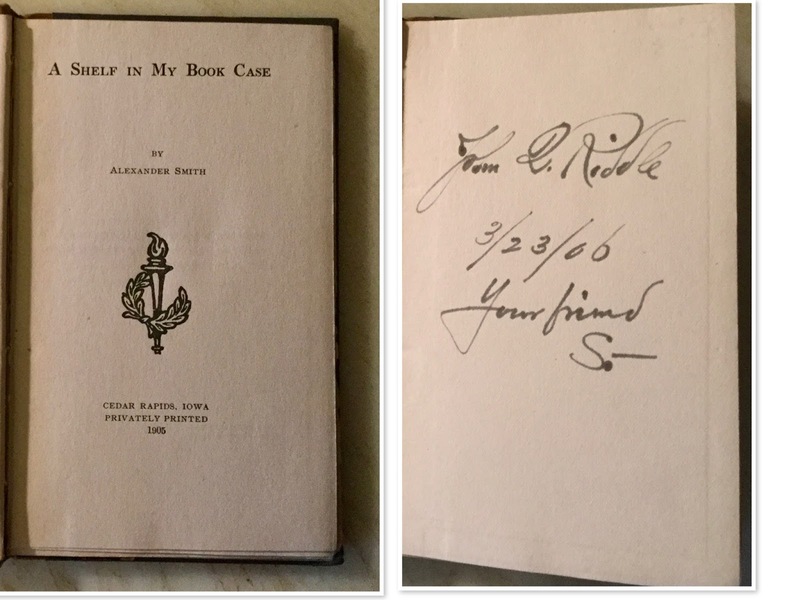 I have already written about some of these authors and about other book collectors who collected them. Today, I will write about Leigh Hunt (1784-1859), and about two American publishers who collected his books: James T. Fields (1817-1881) and Luther A. Brewer (1858-1933). Leigh Hunt was friends with Percy Bysshe Shelley, John Keats, Lord Byron, Charles Lamb, and Robert Browning, to name a few. But he had his detractors as well. Blackwood's Magazine and The Quarterly Review, rival publications of The Examiner, lambasted Hunt and branded some of his friends as part of Hunt's "Cockney School of Poetry." Worse still, in the early 1850s, Charles Dickens, based his unflattering character, Harold Skimpole, in Bleak House, on his friend, Leigh Hunt. From 1808 to 1822, Leigh Hunt was the editor of The Examiner, and shared ownership of the political weekly with his brother John. The brothers survived several unsuccessful prosecutions from the Crown due to the content of their newspaper. But both brothers landed in prison in 1813 because of a libelous article in The Examiner written by Leigh Hunt about the Prince of Wales. In his autobiography, first published in 1850, Hunt revealed that his father, Isaac Hunt, a fervent Tory in Philadelphia, wrote pamphlets in favor of the Crown. And in 1775, his father was saved from being feathered and tarred when a friend of the family overturned a cart full of tar. Isaac landed in prison, but was able to bribe his way out, and escaped on a boat to the West Indies, eventually relocating to England. In 1821, Leigh Hunt , not doing well financially, decided to join Shelley and Byron in Italy to produce a new periodical together. Hunt and his family set sail for Italy in late November, but encountered violent storms causing them to return to England five weeks later. The Hunts finally set sail for Italy on May 13, 1822. arriving in Italy and meeting Shelley in Leghorn in early June. After forming plans for the publication of the Liberal with Hunt and Byron, Shelley set sail to return to Lerici in early July. But his boat sank and Shelley drowned. Hunt had loaned Shelley his copy of Keats's poems, and the book was still in Shelley's pocket when his body was recovered. Only three issues of the Liberal were published before it folded. Hunt edited several other periodicals, all of which had short life spans: The Reflector (1810-1811), The Indicator (1819-1821), The Companion (1828), and the Monthly Repository (1837-1838). Some of his best essays and poems appeared in these periodicals, and were later published in book form. Leigh Hunt's first book, Juvenalia: Or, a Collection of Poems was first published in 1802 when he was seventeen years old. His first published essays appeared in the Traveller in 1807. 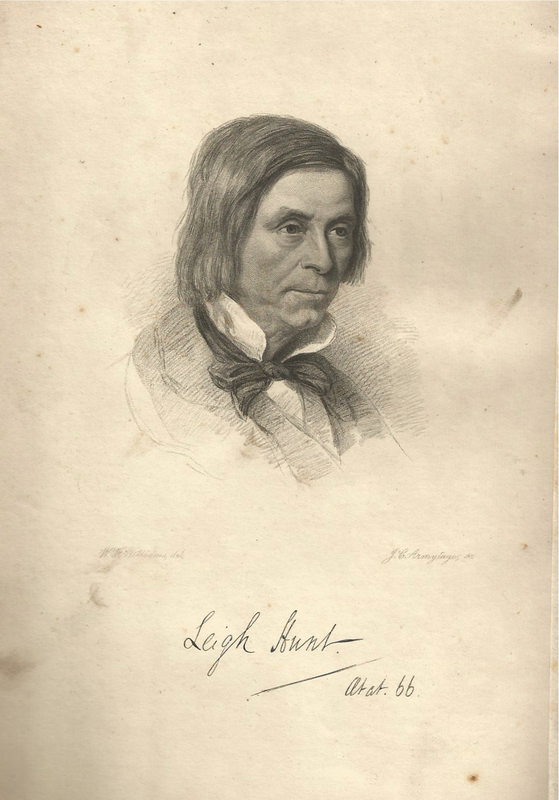 Throughout most of his life, Leigh Hunt endured financial difficulties. It wasn't until Lord John Russell procured a pension of £200 in 1847 for him that Hunt was able to live comfortably. 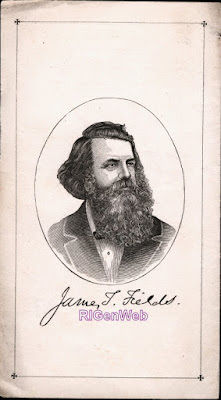 And in his later years, many people of note came to see him, including the American publisher, James T. Fields, who visited him on June 30th, 1859. Hunt died two months later on Sept 1, 1859. James T. Fields (1817-1881) acquired his knowledge, not by going to college, but by beginning an apprenticeship with the booksellers Carter and Hendee at The Old Corner Bookstore in Boston at the young age of thirteen. He remained at The Old Corner Bookstore when William Ticknor became its owner in 1832. And in 1842, Fields became a junior partner in the publishing firm of William D. Ticknor and Company. Fields became a full partner in Ticknor and Fields in 1854. Ticknor ran the business end, and Fields the literary end, assembling an incredible stable of authors: Longfellow, Holmes, Emerson, Lowell, Whittier, Tennyson, Dickens, and Thackeray, just to name a few. In 1859, the publishing firm acquired The Atlantic Monthly magazine and Fields became its editor. When Ticknor died in 1864, Fields sold The Old Corner Bookstore and acquired three more magazines: The North American Review, Our Young Folks and Every Saturday. 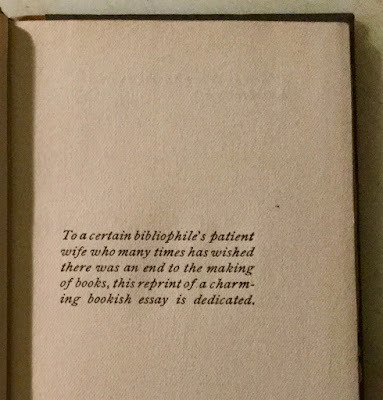 In the October 1861 issue of The Atlantic Monthly, James T. Fields wrote an article entitled, "My Friend's Library," which was supposedly about the books in the library of a lady friend of his. In fact, however, Fields was describing his own library. Two books formerly owned by Leigh Hunt are mentioned in "My Friend's Library." In 1877, "My Friend's Library" and other articles written by Fields for The Atlantic Monthly, were published in a book entitled, Underbrush. 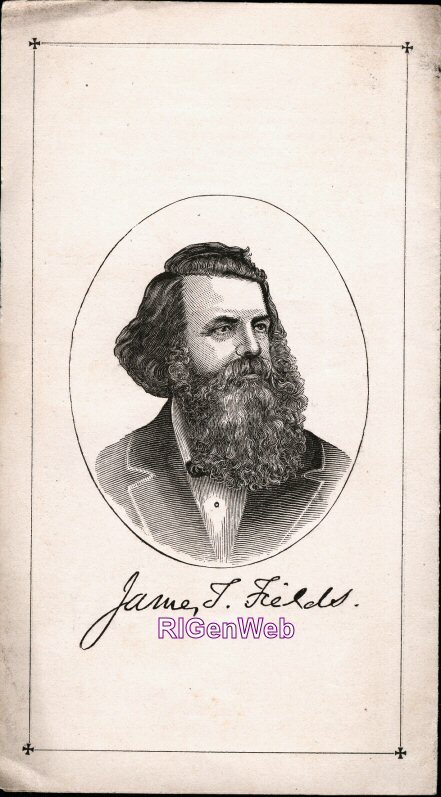 James T. Fields died on April 24, 1881. His wife Annie Fields compiled a book about him that was published the same year: James T. Fields: Biographical Sketches and Notes. And in the book Annie describes in detail their visit with Leigh Hunt in 1859. 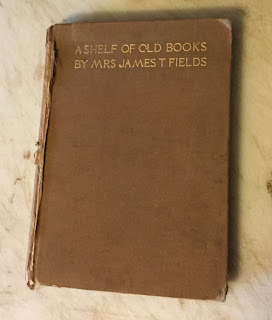 It wasn't until 1888 that Annie Fields publicly revealed that James T. Fields was the owner of the books described in "My Friend's Library." In the March 1888 issue of Scribner's Magazine, the first of a three-part series of articles written by Annie Fields appeared. The first part was entitled, "A Shelf of Old Books: Leigh Hunt." In 21 pages, she provided a detailed description of the books in her husband's library that were formerly owned by Leigh Hunt. 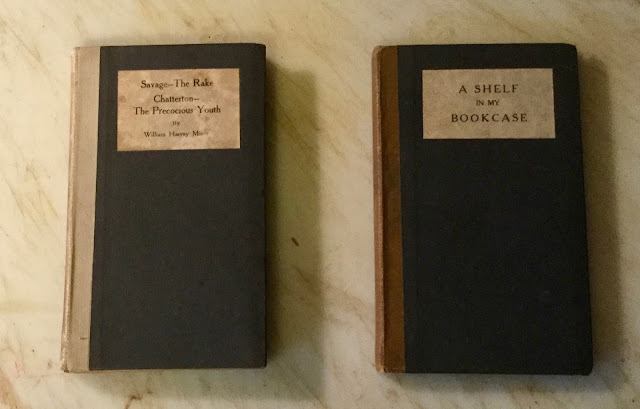 In 1894, Scribner's published all three parts in one book with the same title: A Shelf of Old Books. And in this book, Annie extended the section on Leigh Hunt's books from 21 pages to 67 pages. James T. Fields had purchased Hunt's library of 450 books after Leigh Hunt's death in 1859. Fields kept about 200 of the books for himself, and was over-generous in sharing the remainder of the books with those who wanted them. He later regretted that he didn't keep them all for himself! 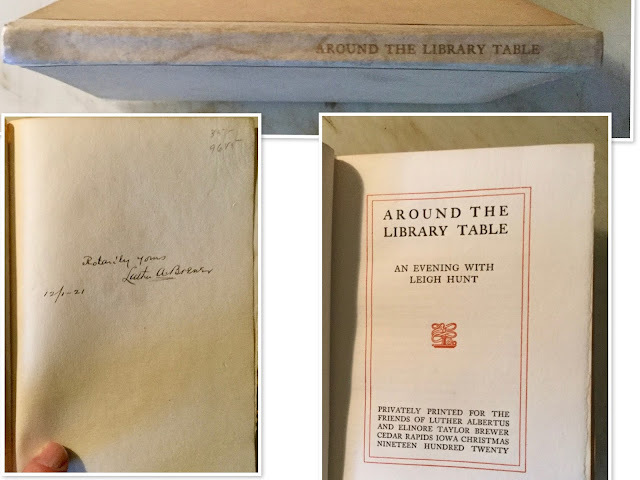 Luther Albertus Brewer (1858-1933) was another American publisher and book collector who wanted to have all of Leigh Hunt's books himself. 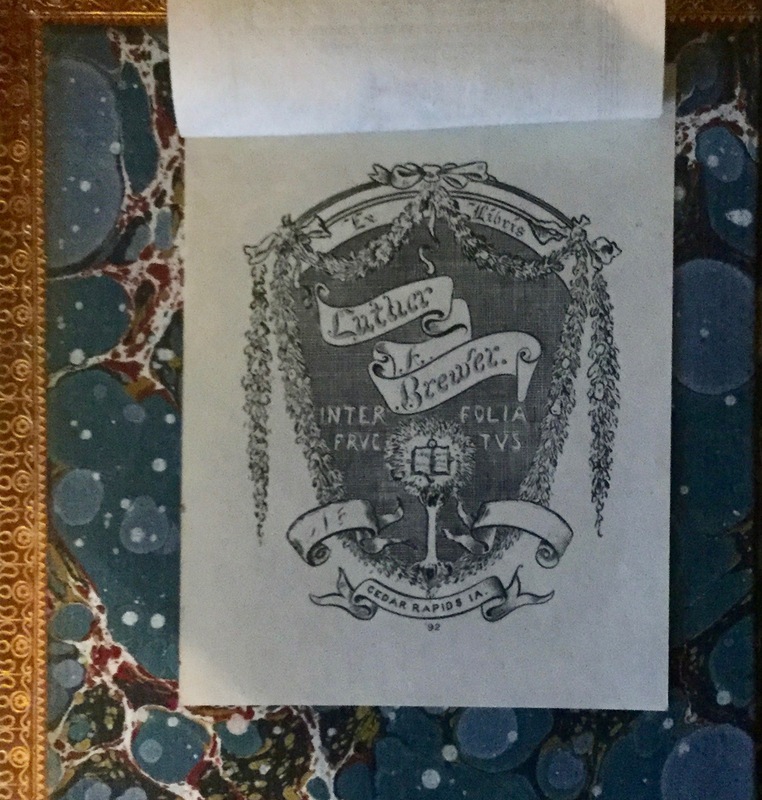 Luther Brewer's earlier "Inter Folia Fructus" Bookplate (1892) "Among the Leaves, Fruit." 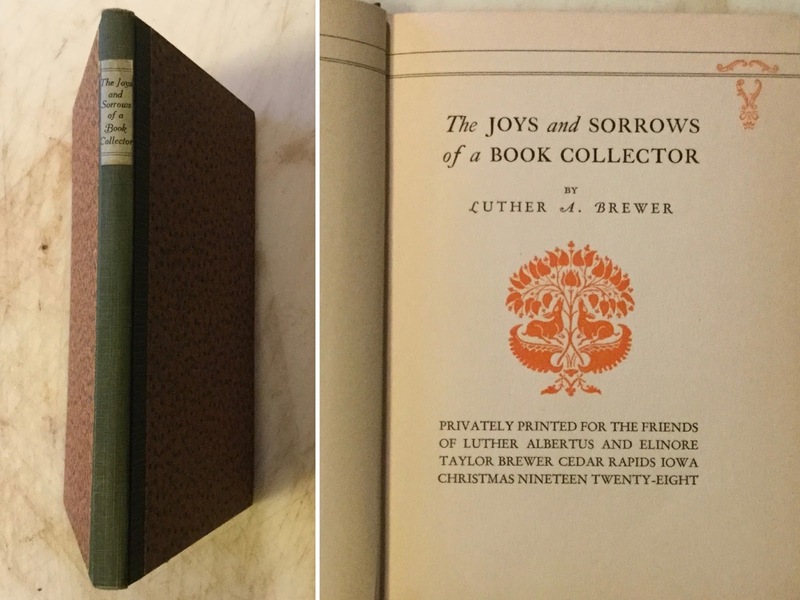 Luther Brewer started collecting books when he was still in grammar school. 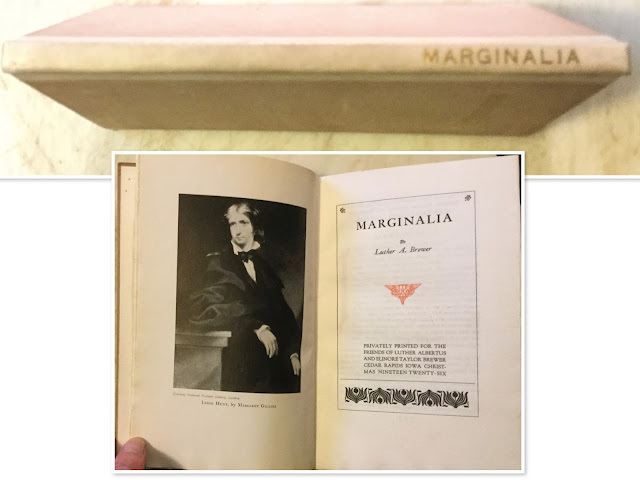 He was a member of the Bibliophile Society of Boston, the Grolier Club of New York, and the Rowfant Club of Cleveland. Unlike Fields, Brewer went to college, graduating form Pennsylvania College in 1883. He tried his hand as a school principal, and then worked in a bank. But he didn't find and learn his true calling until he became business manager of a printing company in Cedar Rapids, Iowa in 1889. Brewer started his own printing company, The Torch Press, in 1905. And it thrived in printing limited editions of books. The Torch Press had its own bookstore as well, the Torch Press Bookshop. 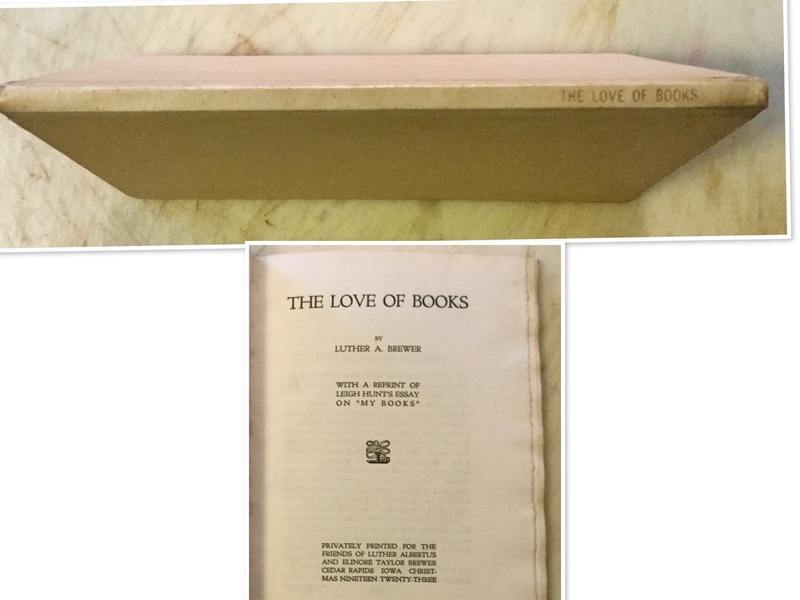 Brewer's friend, William Henry Miner, ran the Torch Press Bookshop. 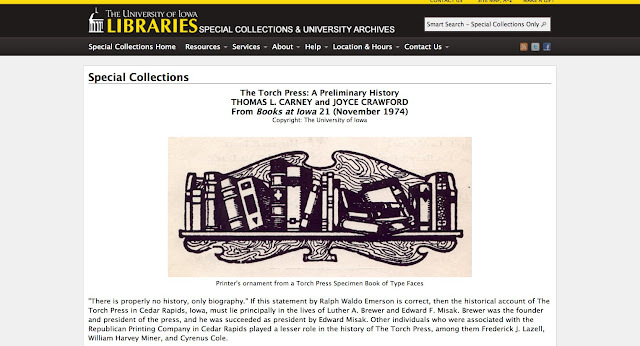 At one time, I thought about collecting Torch Press imprints. But I soon learned that the Torch Press printed way too many books for me to even consider collecting them. I do, however, have copies of the first two books published by the Torch Press. Both books were published in 1905. The author of Savage--The Rake Chatterton--The Precocious Youth was none other than William Henry Miner from the Torch Press Bookshop. He dedicated the book to Luther Albertus Brewer, and inscribed it to his fiancé, Ada, whom he would marry in August 1907. The other book, A Shelf In My Book Case, is one of my favorite essays about books. 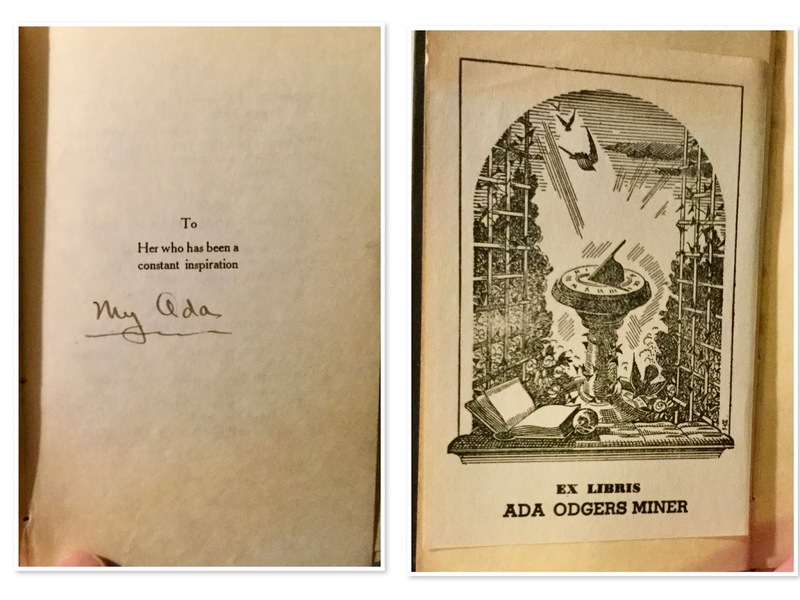 The inscription might be familiar to some of my blog readers. It played a part in helping me identify the bibliophile who signed his name as "S.–" in my June 2014 Biblio Researching blog post, Some Auspicious Biblio-Sleuthing. 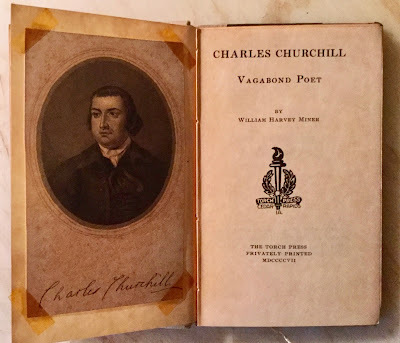 There is a passage on page 37 of this book that referred to Samuel Johnson calling Churchill "a prolific blockhead." In a pencilled note on the front pastedown, a former owner, a Johnsonian for sure, pointed out the reference and transcribed a passage about the conversation from Boswell's London Journal 1762-1763. 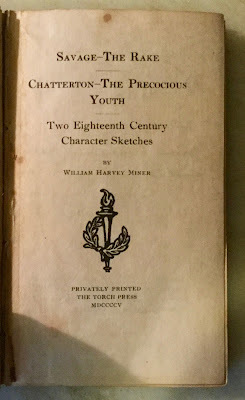 The earliest Torch Press Christmas book I have is the one published in 1914. The "Great Book" written about is Charles Reade's The Cloister and the Hearth, a four-volume set rebound by Sangorski & Sutcliffe. And among the autograph letters described are two from Leigh Hunt. 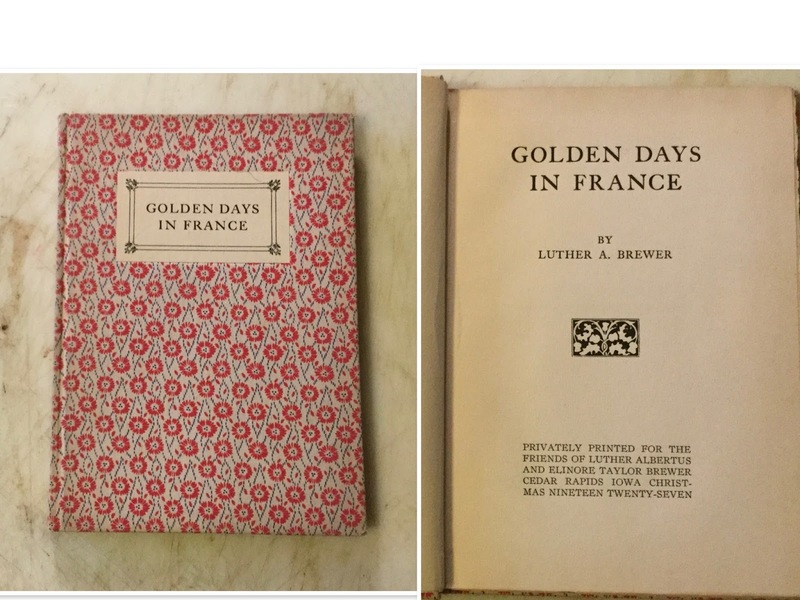 Brewer was already collecting first editions of Leigh Hunt by 1914. He mentions putting one of the autograph letters in a copy of a first edition of Men, Women and Books (1847) and the other in a first edition of The Months (1821). 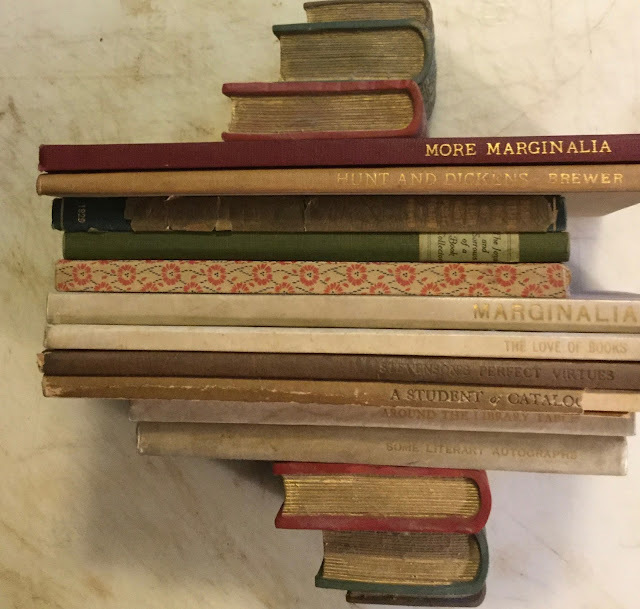 The Brewers and a few of their friends gather around the library table and talk about Leigh Hunt and a few Hunt rarities in the Brewer library. He tells the story of the book that became the cornerstone of his collection: a copy of Wit and Humor, Selected from the English Poets, with an Illustrative Essay and Critical Comments by Leigh Hunt," London, 1846. The inscription in the book reads, ""To Mrs Shelley (I mean 'Mary') from her affectionate friend, L.H." The bookseller Walter M. Hill, a Leigh Hunt collector himself, had recently received the book from London, and intended to keep it for his own collection. But Hill finally decided that the book "would find more worthy companions" in Brewer's library. 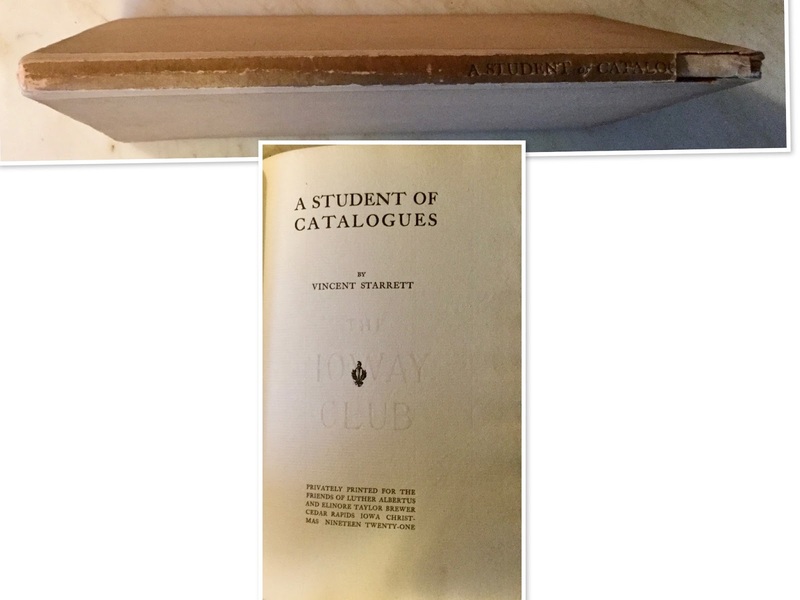 Vincent Starrett wrote a nice piece about learning about books from reading bookseller catalogues. And he mentions Leigh Hunt who would check off the books in a catalogue he would have loved to buy if he only had the money to buy them. 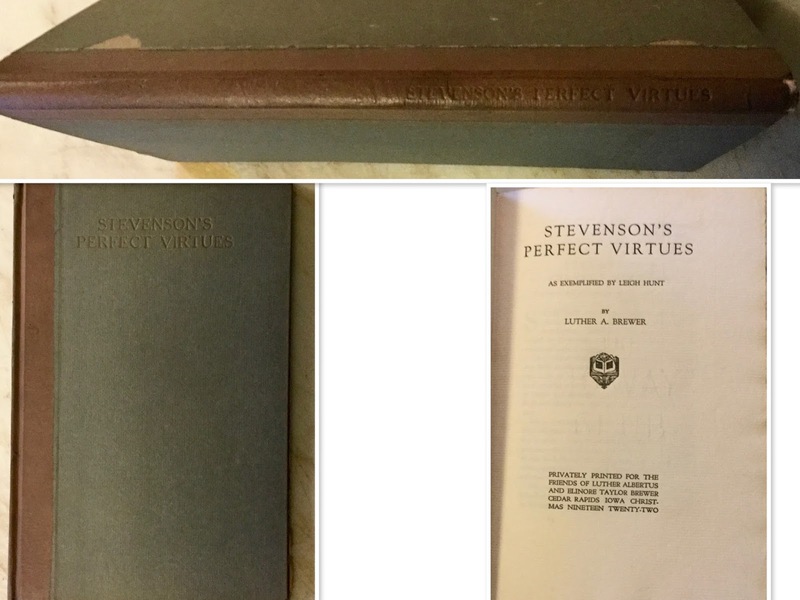 Brewer begins with Stevenson's quotation, "Gentleness and cheerfulness are the perfect virtues," and gives examples of these traits from events in Leigh Hunt's life. 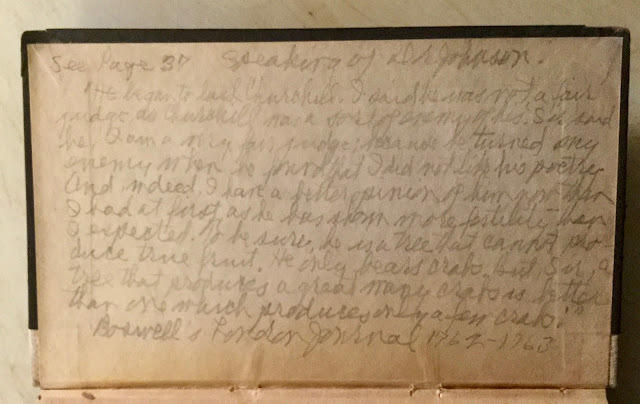 Brewer writes about books in his library containing notes by Hunt and others written in the margins of books. A book in Italian, Scelta di Soneti, , with marginalia in Hunt's hand, was formerly owned by James T. Fields. 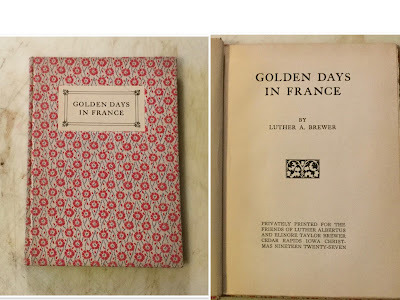 This book is about the Brewer's trip to France in 1927 with their friends the Snyders. Brewer still manages to bring Leigh Hunt into the conversation when writing about their visit to Vaucluse. Petrarch lived there and Hunt wrote about Petrarch in an 1820 Indicator essay, entitled, "On Receiving a Sprig of Laurel from Vaucluse." Brewer also mentions having a copy of Hunt's poems containing his translation of "Petrarch's Contemplations of Death." Brewer writes about his wins and losses in the book collecting game. One tragedy concerned a letter from Hunt to Lord Byron about what they should write in their upcoming periodical, The Liberal. 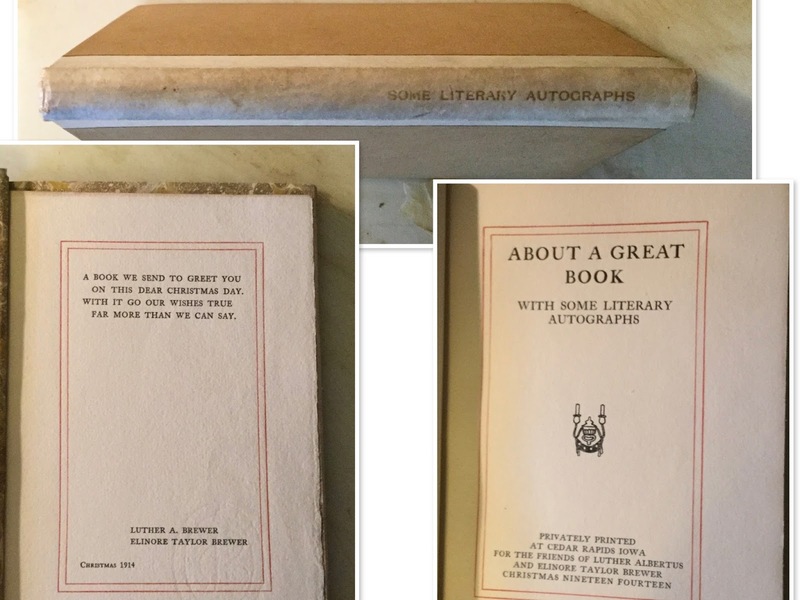 When Brewer contacted the autograph dealer who listed the letter, he learned that a millionaire book collector already purchased it and refused to give it up. Brewer also mentions a number of Hunt items from the Buxton Forman sales. Luther Brewer had over two hundred letters written to Leigh Hunt and about two hundred letters from Leigh Hunt to his friends. And Brewer prints and discusses extracts of these letters in this book. Brewer discusses Dickens's portrait of Skimpole (Leigh Hunt) in detail, and includes the viewpoints of Edmund Blunden, Sir Arthur Quiller-Couch, Andrew Lang, and others in condemning Dickens's actions. The former owner of this book, W. S. Dysinger, was a local Lutheran minister whose church was either in Cedar Rapids or Iowa City. 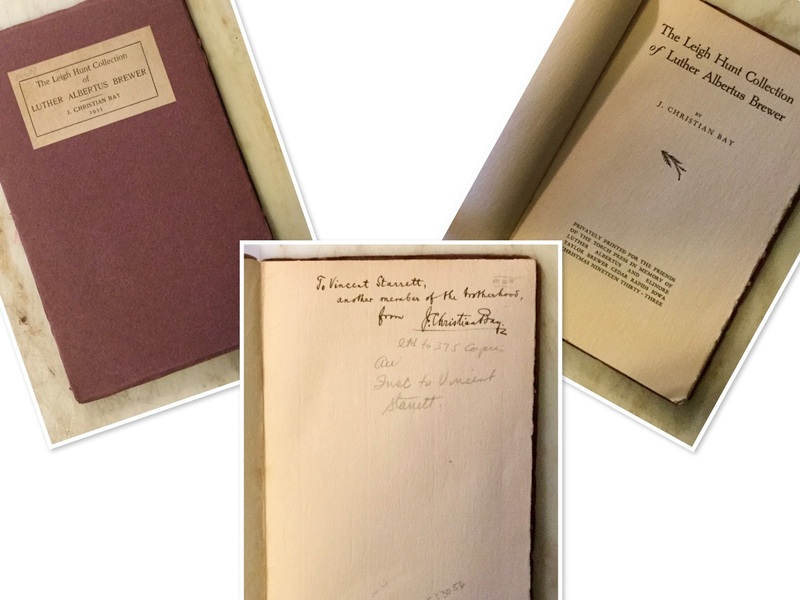 In 1846, Henry Edward Napier presented Leigh Hunt with a set of his six-volume work, Florentine History, which found its way into Luther Brewer's Leigh Hunt collection. His friend, A. Francis Trams, wrote a piece about the marginalia in these books and gave Brewer permission to print the piece as the Torch Press Christmas Book for 1931. Trams counted 3000 markings by Hunt in these books, ranging from an exclamation point to 200-word paragraphs. Luther Brewer passed away on May 6th, 1933. And around Christmas that year, the Torch Press printed a book by J. Christian Bay about Brewer's Leigh Hunt Collection. Bay provides a history of the collection as well as a description of the Torch Press Christmas Books. And he gave this particular copy of the book to Vincent Starrett. In 1934, the University of Iowa acquired the Luther Brewer Collection of Leigh Hunt for $20,000. A good portion of the amount was provided for by an anonymous donor. The collection contained 2000 volumes, 500 first editions, and 45 books given by Hunt to his friends. 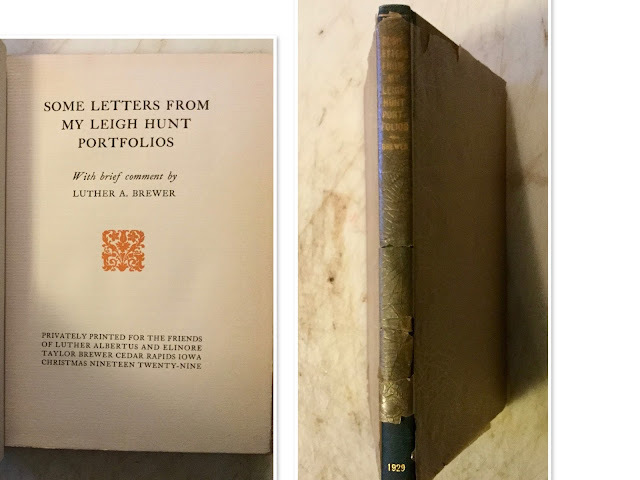 I have one more book by Luther Brewer heading my way: a copy of My Leigh Hunt Library: The First Editions, the 1970 Burt Franklin reprint of the 1932 edition. Although not a part of the Torch Press Christmas Series, the book is a must for for my Leigh Hunt/Luther Brewer Collection. And I'm surprised I waited this long to acquire a copy! 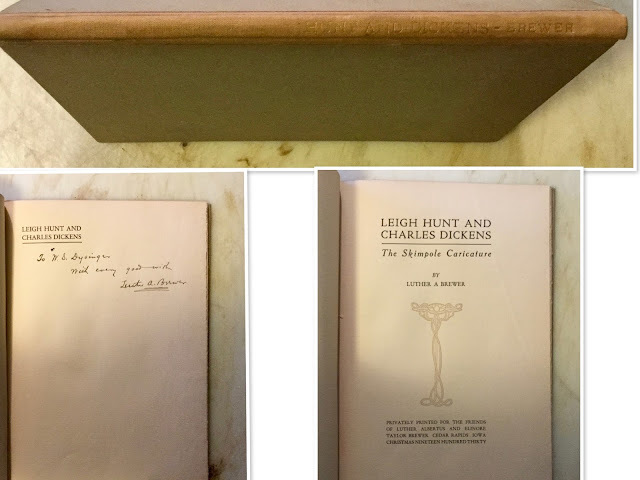 And while I have yet to acquire a book from Leigh Hunt's library, I am happy to say that I have one of Leigh Hunt's books from Luther Brewer's library: his copy of Volume II of A Book for A Corner. Brewer's bookplates pasted in this book are displayed at the beginning of this section on Luther Brewer. 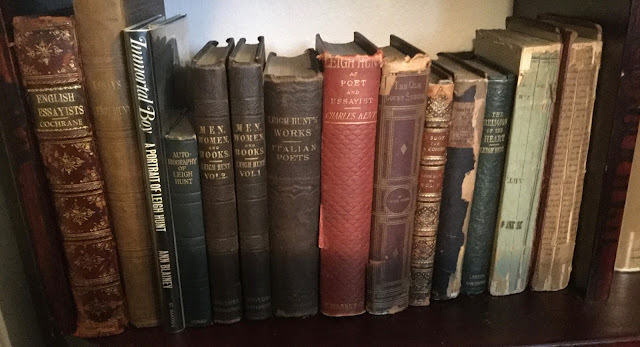 A Book For a Corner is the cornerstone of my motley collection of Leigh Hunt books shown below. I can remember the first Leigh Hunt book I bought: Leigh Hunt: Poet and Essayist, edited by Charles Kent, and published in London by Frederick Warne and Co. in 1889. 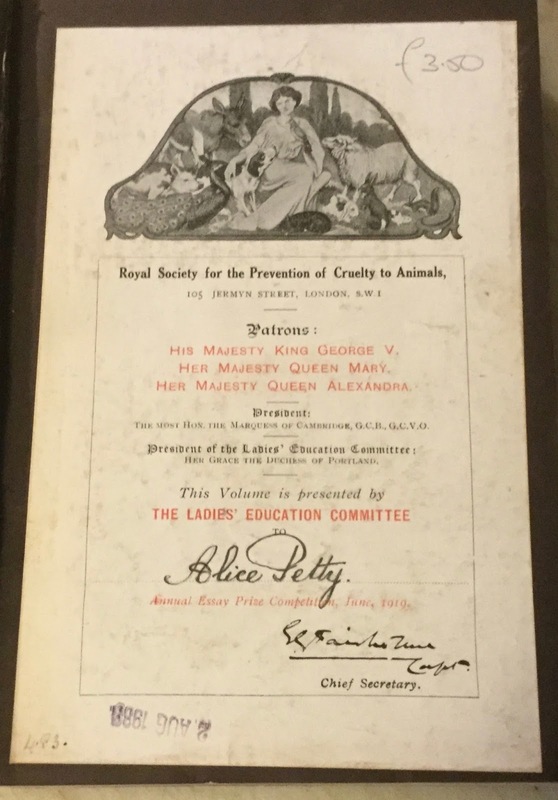 It was a prize book given in 1919 to the winner of an Annual Essay Prize Competition sponsored by the Royal Society for the Prevention of Cruelty to Animals. While still in the bookstore, I read Hunt's essay, My Books. And for £3.50 the book was mine! 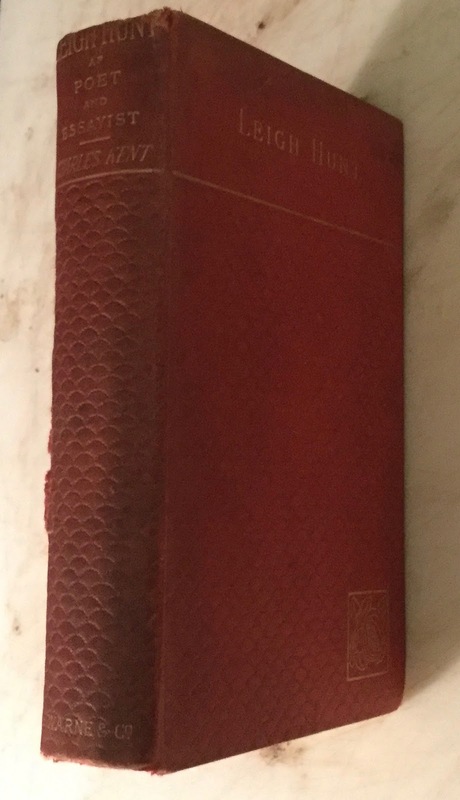 Men, Women, And Books by Leigh Hunt, New York: Harper & Brothers, 1847, two vols. 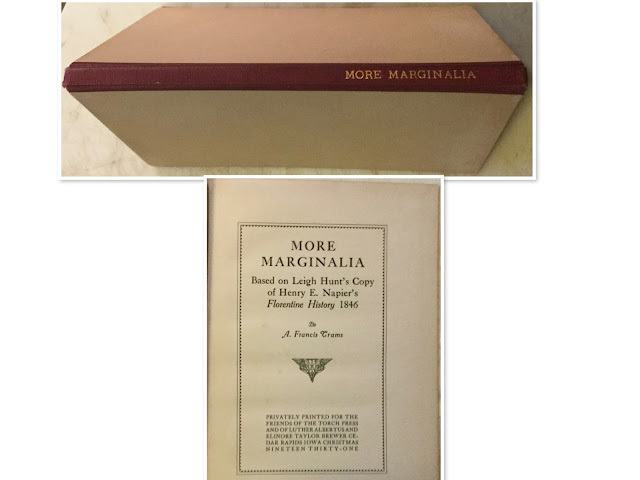 A Book for A Corner; or Selections From Prose and Verse From Authors the Best Suited to That Mode of Enjoyment by Leigh Hunt, London: Chapman and Hall, 1849 vol II only. 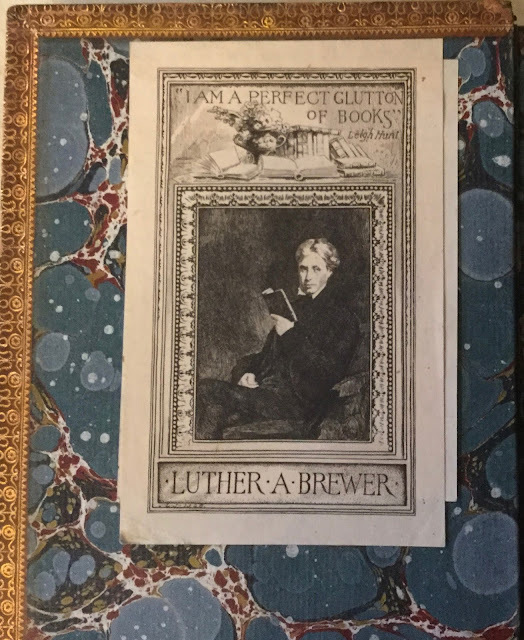 Luther Brewer's copy with his bookplates.